Confederacy, Atlanta, Ga., 1861, 5¢ black, provisional "Atlanta, Geo. 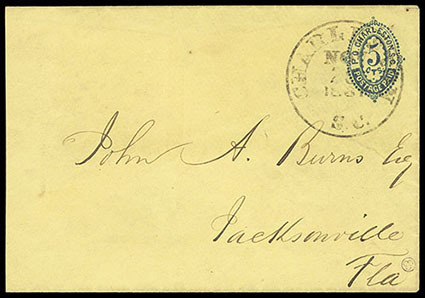 Paid 5" handstamp under 1861 5¢ green (four large margins, CSA #1) tied on cover by "Atlanta, Ga., Jan. 12, 1862", addressed to Washington, Georgia, Extremely Fine and choice; with 2018 C.S.A. certificate. Scott No. 6XU5 Estimate $1,000 - 1,500. These new discoveries are good examples of adversity usage of handstamped Provisional covers. 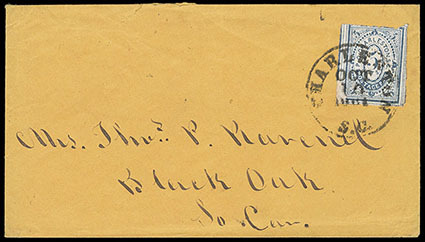 The 5¢ stamp paid the postage to have this cover sent in the mails not the ATLANTA, GEO., PAID 5 handstamped provisional. The Surveys of the Confederate Postmasters' Provisionals, page 689, shows a total of 4 recorded for this type. The difference between the handstamped provisional envelopes and the handstamped and manuscript rate markings used by the vast majority of postmasters was that all provisional were prepared in an advance of use. Confederacy, Charleston, S.C., 1861, 5¢ blue, huge margins including left sheet margin and two outer framelines, other sides clear, tied by "Charleston S.C., Sep 24, 1861" double-circle datestamp on buff J.N. Robson Commission Merchant corner card cover to Concord N.C.; minor edge flaws expertly restored, Very Fine, ex-Calhoun (illustrated in his book on p. 74) and Gimelson. Scott No. 16X1 Estimate $2,000 - 3,000. AN ATTRACTIVE SHEET-MARGIN EXAMPLE OF THE 5¢ CHARLESTON PROVISIONAL ADHESIVE ON AN ADVERTISING COVER. The Calhoun census lists approximately fourteen examples on corner card covers. However, many are embossed and do not clearly show the design. The example offered here, with sheet margin and clear corner card, is especially desirable. 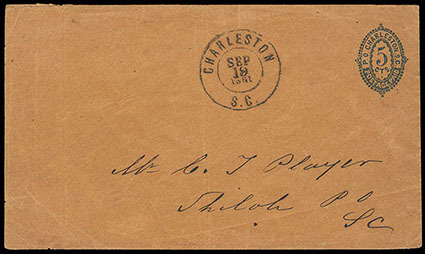 Confederacy, Charleston, S.C., 1861, 5¢ blue, in at bottom right, tied by "Charleston, S.C., June 19, 1862" cds on cover sent to Pleasant Lane, SC., Fine. The Charleston, SC adhesive stamp was lithographed in blue on white wove paper by Evans & Cogswell Company of Charleston and placed on sale 4 September 1861. 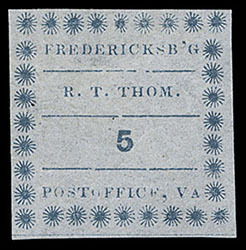 In April-June of 1862 these provisional stamps were reintroduced during a shortage of availability of the General Issues. 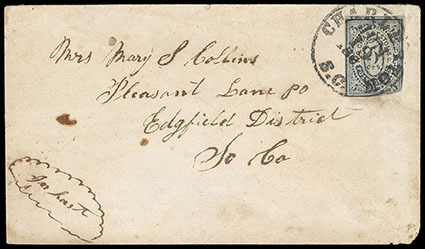 This cover is 1 of the 6 examples recorded used in the shortage period from April-June of 1862. Illustrated in the Calhoun book on p. 83. Confederacy, Charleston, S.C., 1861, 5¢ blue, large margins to in at top, scrape at bottom left, tied by neat "Charleston, S.C., Oct 10, 1861" cds on cover sent to Black Oak, SC., F.-V.F., ex-Calhoun. 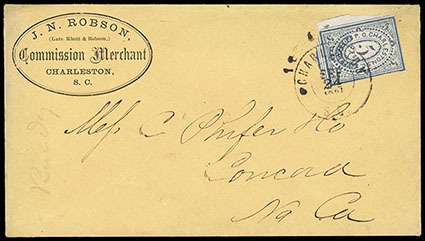 Confederacy, Charleston, S.C., 1861, 5¢ blue, small toned spot at bottom & two tears at top, tied by "Charleston, S.C., Nov 1, 1861" double circle postmark on cover to Camden, S.C., reduced at left, Fine, ex-Calhoun. 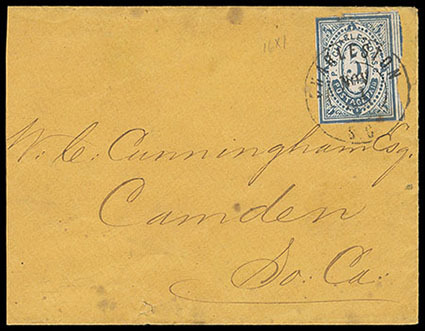 Confederacy, Charleston, S.C., 1861, 5¢ blue on amber, entire postmarked "Charleston S.C., Nov 25, 1861" sent to Jacksonville Fla., reduced at left, Very Fine, ex-Ferrary, Calhoun. 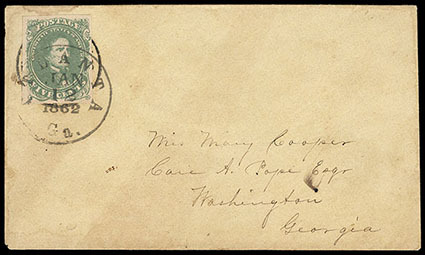 When the Confederacy took control of the mail system on 1 June 1861, there were no stamps available. To meet the demand for this convenience, some postmasters prepared substitutes in the form of stamps, printed envelopes, and handstamped envelopes. The Charleston, S.C. typographed entires were printed by Evans & Cogswell Company of Charleston on envelopes of various colors and placed on sale 15 August 1861. Confederacy, Charleston, S.C., 1861, 5¢ blue on orange, cancelled by sharp "Charleston, S.C., Sep 19 1861" double-circle datestamp to Shiloh S.C.; reduced slightly at left with small edge tear, clean and Very Fine. Confederacy, Fredericksburg, Va., 1861, 5¢ blue on bluish, large margins all around, bright and fresh, without gum, light thin, Very Fine appearance. 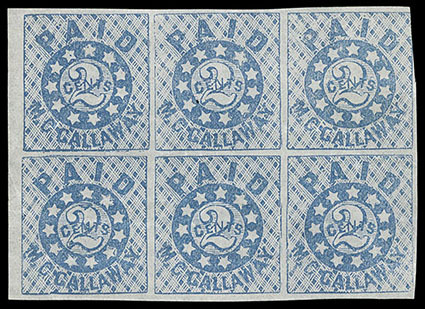 Confederacy, Memphis, Tenn., 1861, 2¢ blue, left margin block of 6, interesting malformed "2" on position 4, without gum, light wrinkling and crease affecting bottom left stamp, otherwise Very Fine.